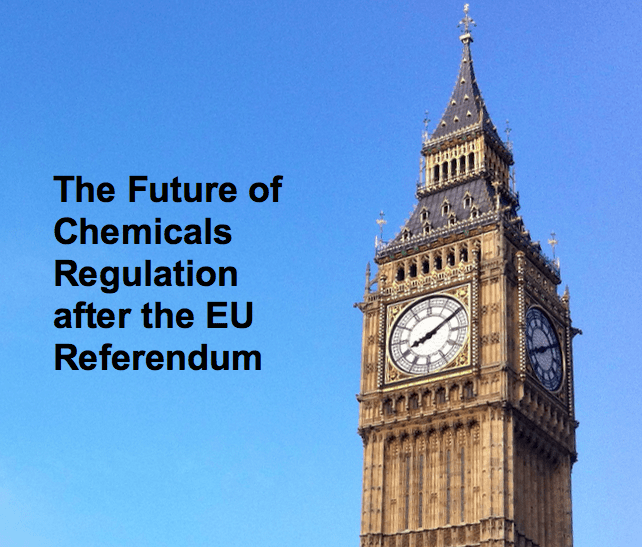 On Wednesday 20th December, UK Members of Parliament will vote on an amendment calling on the UK Government to remain in the EU’s REACH chemicals regulations after Brexit. The amendment (NC61), which has been tabled by the Chair of the Environmental Audit Committee, Mary Creagh MP, comes after both industry and civil society groups made it clear that they believe that the UK should stay in this world-leading regulatory system. The EU’s chemical regulatory system relies on a centralised chemical agency in Helsinki (ECHA), which hosts the world’s largest database of chemical safety and use. The UK will lose access to this database on Brexit, unless it negotiates continued membership as part of a post-Brexit trade deal. However, the UK Secretary of State for the Environment Michael Gove has made it clear that he wants the UK to have its own approach to chemical regulation after Brexit; this would be incompatible with REACH membership. Tens of thousands of chemicals are used in our everyday products – many have no problems, but it is a complex and demanding job working out which chemicals are harmful (accumulating in our bodies, or disrupting our hormones, for example) and then working to get them replaced with safer alternatives. Chemicals are also at the root of manufacturing industry, going into all products, in uses as diverse as dyes, glues, plastics and electronic components. The EU’s REACH chemicals regulation has been in operation for just over ten years, and it covers all EU countries and those in the European Economic Area (EEA). CHEM Trust has been highlighting the health, environmental and business arguments for the UK to stay in REACH, and we recently joined with a range of civil society organisations to write to Michael Gove asking for the UK to remain in REACH. UK industry is also very concerned about leaving REACH, and the chemical and pharmaceutical industry trade associations have recently sent a joint letter to Michael Gove asking him “to do all he can to remain within or as close as possible” to the EU REACH system (see coverage in the Financial Times). A recent survey found that the British public, whether they voted Remain or Leave in the Referendum, do not want any reduction in the regulations that protect people and the environment from potentially harmful chemicals. The UK Parliament is currently debating the EU Withdrawal Bill and on Wednesday 20th December they are due to vote on the amendment that asks for the UK to stay in REACH (see full text below). CHEM Trust supports this amendment, and encourages people to take action and contact their MPs via the Women‘s Environmental Network website, or to email or tweet your MP asking for them to vote for amendment NC16. The Greener UK coalition have produced a briefing on this amendment. For further information, see our Chemicals & Brexit web page. Mary Creagh MP was interviewed yesterday by the BBC about REACH and Brexit – see the video attached to this tweet. Mary Creagh’s speech in the UK House of Commons last night is available here & select her speech at 19.55. In the end the MPs only voted on a small number of amendments, not including this one. The bill now continues through the UK Parliament’s processes – see their web site for details. Next post: Will you be using toxic napkins at Christmas?